Both of the following techniques could dramatically lower the energy needed to achieve fusion conditions. Lower energies are easier to obtain than higher energies, giving these techniques an advantage when compared to other Inertial Confinement Fusion (ICF) systems. We discussed ICF fusion in a lot of detail in our previous article on laser implosion fusion, the most researched technique in ICF so far. We suggest reading that article before this one unless you are familiar with how ICF works. Beginners may want to start even earlier with our introduction to nuclear fusion power. The z-pinch technique originated in an effort to use magnetic fields to crush a plasma using extremely powerful electric currents through a plasma. This was thought to be possible because plasma with a large current through it tends to ‘pinch’ itself, collapsing quickly into a column between the source of the current and the sink where the current is going. This is rather anti-intuitive, and requires some study of the underlying science to understand why currents create magnetic fields that create this effect. It was found that this pinching could not possibly create fusion conditions as long as the plasma being blasted by current was the fuel plasma. This finding led to this technique being essentially abandoned as a feasible fusion technique. Research in this area has renewed its vigour in recent decades because of the discovery of a new and interesting technique. Rather than using the fuel plasma as the current carrier, these new devices use a heavy metal such as tungsten or stainless steel as the current carrier. Wires made out of these metals are arranged in a cylindrical shape around the target fuel capsule. Enormous current is then fed through these wires, causing them to instantly vaporize into plasma. However, this plasma can still carry current. As the current continues to rage through the metal plasma, it causes the z-pinch effect to happen, where the metal plasma rapidly collapses towards the fusion core. This rapid movement causes the plasma to heat up to incredible temperatures (3.7 gigakelvin has been achieved). Plasma at these enormous temperatures emits huge amounts of X-rays. These cause extremely rapid heating of the fusion fuel target. If the temperature is high enough, it will cause the fuel pellet to begin undergoing fusion reactions, and even achieve fusion ignition. This technique has already been used to transform about 10-15% of the electric input power into X-rays. This is impressive by comparison with laser implosion fusion for instance, which has efficiencies of about 1% in current systems, with hopes of reaching 10-20% sometime in the coming decades. This has attracted some definite attention from the scientific community. 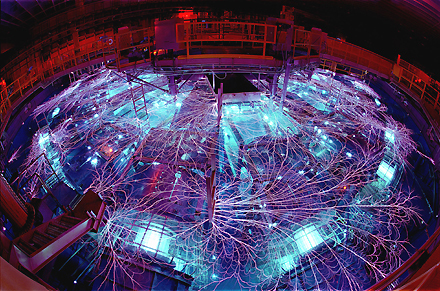 The only major device that utilizes this technique for research currently is the Z machine, built at Sandia National Laboratories in the United States. It has achieved some incredible things, and has stimulated a lot of interest in this area of fusion research. Lastly, on an aesthetic note, the Z machine creates some really cool visual effects, as you can see below. Image from Wikimedia Commons, but there is a super high resolution one available at Sandia’s website. What is going on in this picture? That is lightning between the conducting materials in the room when the z-pinch is fired. The voltages are so extreme that there is an electromagnetic pulse created that makes currents appear in almost all materials nearby. These techniques are based on laser implosion fusion. We recommend you familiarize yourself with that technique before digging deeply into these laser fast ignition systems. The idea is to use laser implosion fusion to create the shockwave that rapidly compresses the fusion fuels, and additional techniques for heating the core up the additional amount necessary to reach ignition state. The basic idea is to hit the core with another laser burst just as the shock waves from the laser implosion are compressing and heating the core as well. This was infeasible until relatively recently because it was not possible to construct a laser that could deliver enough energy in a small enough time. To dig more deeply into this topic, we are going to discuss how the HiPER project proposes accomplishing this task. We can think of the standard laser implosion system as ‘setting the stage’. It will create a condition in which the outer layers of the fuel pellet are exploding, sending the powerful shockwaves towards the center. As the core reaches its maximum compression, the fast ignition system will heat it to the ignition state. How will HiPER do this? A second set of lasers will be used only for actually heating the core. In order to deliver enough energy in this very small time window, this laser system needs to be able to deliver a pulse of energy in an extremely small amount of time. The HiPER lasers will be able to deliver a pulse in 10-20 picoseconds. To do this they need to use chirped pulse amplification (CPA). CPA essentially relies on splitting a beam into high frequency and low frequency components in order to stretch it out in time. At this point we have a laser pulse that might be around 10-20 nanoseconds in length, or 1000 times as long as we want the final pulse to be. This much longer pulse can be amplified using relatively standard amplification techniques. Now we have a long, high-power laser beam. Now we reverse the first process. Instead of splitting the beam and stretching it out, we combine it. This shrinks down the pulse length by a factor of a thousand. The result is an incredibly high-energy pulse that is only 10-20 picoseconds long. This allows for much higher laser intensities than is possible using standard amplification. Chirped systems can currently reach a power per unit area of up to 700 gigawatts/cm2. Lasers of this power level have to be shot through vacuum to avoid self-focusing. When an incredibly high-power laser is shot through the earth’s atmosphere for instance, it will tend to self-focus and become decoherent. This will tend to lead to the instant creation of plasma, huge energy losses, and possible damage to the laser system itself due to back reflection. Infrared light produced by glass lasers tends to interact strongly with electrons. This means that if we fire infrared light at the target, a lot of the energy will be lost through interactions with the electrons and thus not reach the target. Optical frequency multipliers are used to push the frequency in to the ultraviolet range, where it will strike the target more directly. For HiPER, the ignition pulse is around 70 kilojoules of laser energy but a peak power of 4 petawatts. The idea is to hit the side of the core, creating a shower of relativistic electrons that rapidly heat the core to ignition. Fusion energy gain factor, including losses and inefficiencies, is expected to be around Q = 72, a very impressive number! Some innovations in solid-state lasers are expected in the coming decades. There are hopes that these innovations can increase the efficiency of laser systems to 10-20%, a huge leap over the approximately 1% efficiency that lasers are capable of today. There is a problem though, we can’t hit the core directly. There is a sphere of exploding plasma in the way. If we attempt to fire through, we are likely to lose most of our energy before the beam reaches the target. We have to find a way to expose the core so that our ignition lasers can hit it more directly. I am aware of two proposed ways for doing this. Use a third laser pulse, just before the ignition pulse, to blast away the plasma that is in the way. It seems that this technique relies on superheating the plasma even more quickly, causing it to rapidly disperse and thus be less of a nuisance for the ignition laser. Use a hollow gold cone built into the metal shell of the fusion pellet. This gold will resist being vaporized into plasma, and will thus help shape the expanding plasma cloud in such a way that it will be possible to fire the ignition laser through a mostly clear vacuum until it hits the gold. I guess at this point the fast ignition laser ‘strikes gold’, rapidly heating the gold and creating a shower of hot electrons. These electrons then hammer the core, rapidly heating it to fusion conditions. Thanks to all of these innovations, laser fast ignition systems will use smaller and less powerful lasers than the National Ignition Facility (NIF). This is why when we compare the expected costs of HiPER, we see that they are an order of magnitude smaller than the costs for the NIF. The advent of fast ignition systems brought back genuine feasibility for fusion power from laser ignition systems recently. Using systems such as the NIF or the Laser Megajoule, it was expected that laser implosion fusion was several decades away at least. If fast-ignition systems pan out, they will certainly replace the simpler laser implosion systems. In the case of laser fast ignition, it is of course clear that fast ignition has leveraged the knowledge framework gained by the laser implosion research of the previous decades. These are compelling ideas about what might be possible with regards to nuclear fusion power. I am happy because it seems that both of these techniques are being researched. Thankfully there is enough interest in fusion ignition (partially due to its military applications) that funding for fusion projects tends to be both timely and substantial. I for one am very excited to hear how these experiments, especially HiPER, pan out. Pingback: How can we create power from nuclear fusion?